At Candlewood Suites Avondale/New Orleans our extended-stay guests are given all the comforts of home and treated like family. 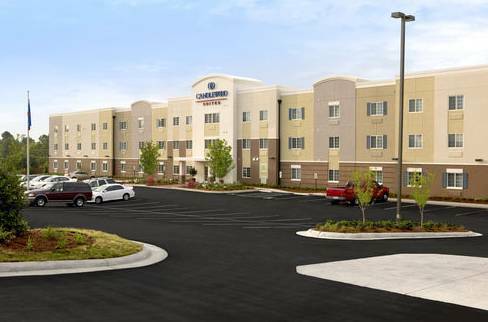 Candlewood Suites Avondale is located just two miles from the Huey P. Long Bridge & only 20 minutes from the nightlife and history of the French Quarter. Harch Hyperbaric Oxygen Therapy, Union Pacific, BNSF, Monsanto Chemical, Waterford 3 Nuclear Plant, Churchill Tech and Business Park, Winn Dixie Grocery Store, TPC and Alario Center are just a few companies close to the hotel. We give you the amenities that make you feel right at home with extra space to rest and relax, including fully equipped kitchens in every suite. Shopping, dining and great nightlife are only a short drive away. Take time to enjoy some of the local sites: Allstate Sugar Bowl, NOLA Saints Training Ctr, NOLA Pelicans, NOLA Motorsports Park, NOLA Babycakes AAA, Audubon Zoo, Bayou Segnette State Park, & Boomtown Casino. After a long day of work or play enjoy an evening in our Gazebo relaxing or fire up the grill to prepare your favorite dish or when you crave a late night snack you can grab a treat from our Candlewood Cupboard, open 24-hours. Just want to relax in the room? That will be easy to do with our free high-speed internet and expanded high definition cable with 200 channels including HBO. Don't forget about our complimentary self-laundry facilities. Clearview MallShopping center with 60+ shops, including well-known & big-box stores, plus a cinema & restaurants. Tournament Players Club of LouisianaLegendary architect Pete Dye designed the golf course with the collaboration of fellow PGA TOUR players Steve Elkington and New Orleans native Kelly Gibson. This Louisiana golf course is the perfect complement to the local ambiance. NOLA Motorsports Park23 acre facility with miles of race track plus go kart rentals, driving classes and event hosting.